Safely away from any roads is a purpose built children's play area, with swings and slides and other apparatus for generally monkeying about, and take in the breath taking scenery! At the top of our site, safely away from any roads. Lots of space to play and lots of things to play on! Slides, zip-line, swings, ball throwing, climbing, surfing and much more!! In addition to our large play area, we also have a tractor play area for under 5s! 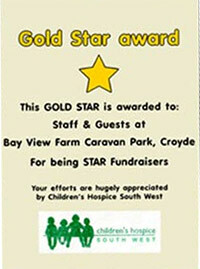 With the help of our lovely guests we won a Gold Star award for the money that has been raised for the Children's Hospice South West.